The malignant ghosts are corrupt spirits that devour the souls of both living and deceased humans. Hollows settle in Hueco Mundo but can cross over to the human world to devour souls. 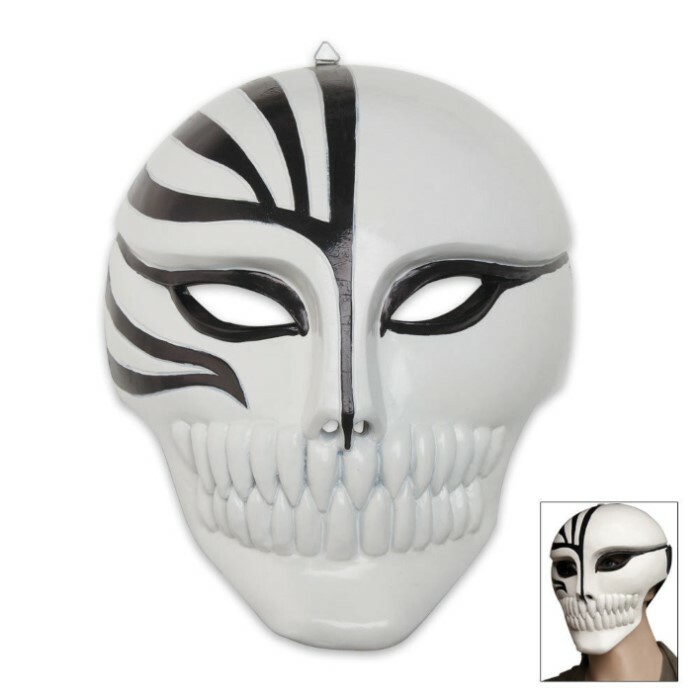 Now you can protect your soul -- be disgusting as a hollow with this mask. Made from a solid and thick resin cast almost 1/2 in. thick. This is not a cheap flimsy plastic mask. Includes 1 in. black elastic strap for wearing. I don't know how well everyone else's was made, mine is bit off center. It was worth it though. I got it for my older brother because he loves Bleach. It's a bit heavy to wear, You could wear it, if you want your nose to be flat. This was a long time ago that I bought this, but I finally have time to go back and review it. The mask is very heavy and barely wearable. By that I mean that it is extremely uncomfortable to put on, wear and breathe through. Not really worth the money. to tell your the truth i was really looking forward to this product but it was not as good as i thought. before you buy im gonna tell you all the things wrong with this mask. 2. the material this is made out of is suckish and makes the mask uneven. by that i mean the sides like where ur cheaks and jaw should be are uneven like one side is bigger then the other. 5. the mask is like 15 pounds and unless you have a very round and porpotional head or a big head it will slide off a ton. As noted on the product listing, this mask is "Made from a solid and thick resin cast almost 1/2 in. thick." It is designed as a heavy mask to be suitable for both wearing and collection display use. Each is painted by hand and will come as shown in the product image. Should you have any concerns about your mask, or just questions about our products or service, please contact us so that we may help. Thank you! No complaints, and I've read that the paint looked like a dark brown, mine it jet black, it is heavy but i wore it thru half the con i was at no problems, great buy. The hollow mask looks great! Its a good piece for those who collect BLEACH items. As expected it arrived in three days. It's not too heavy or too light of a mask. Even though that the paint job on it is kinda poor. But thats nothing that you cant fix your self! But for its price there no reason to complian. Still a good buy in my opinion. There should be more hollow masks pick from!